On Friday, October 27, twenty 1Ls joined 2Ls and 3Ls interviewing in Washington, D.C. at Equal Justice Works (EJW), the largest legal public sector career fair in the country. EJW hosts 300-plus employers from Alaska to Maine including government agencies, legal aid organizations, public defenders, and legal advocacy groups. All EJW employers participate in a dedicated table talk, where any students can go up and speak to attorneys, as well as interview pre-selected candidates. The energy here is fantastic – the hotel is full of students and attorneys who are passionate about what they do. EJW is a fantastic opportunity for 1Ls for several reasons. First, you have the opportunity to learn more about what it means to be a lawyer in a variety of different settings or the work done in many different practice areas. You will likely make invaluable connections that can lead to formal interviews for summer jobs. Second, it also gives students an opportunity to meet with organizations from around the country – we had students interviewing in Seattle, Miami, Alaska, and Arizona (amongst many other locations!) I recommend any 1L attend, even if they are not focused on public interest careers. Sometimes you don’t know if an organization or practice area is a good fit until you get more perspective on it. It is also a great way to develop networking skills and get used to large job fair environments. 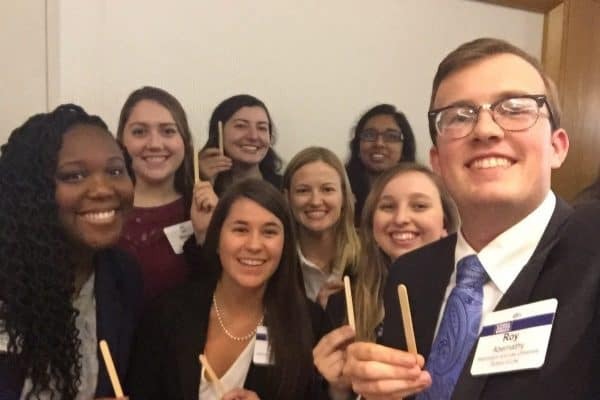 Washington and Lee students are well-positioned to take advantage of EJW and leverage connections made at the event. We are a three hour drive from DC, and many students car-pooled on Friday. The close location also makes it possible for OCS staff to attend the event. I spent the day giving interview and networking advice, recommending organizations to talk to, and providing logistical support. Many students also received interview tips from alums they reached out and met with people that alums recommended they connect with. Those who came out the night before joined us at the Public Interest Law Student Association networking event graciously hosted at K&L Gates. It offered the chance to connect with alums, including many 2017 graduates, and amazing view of the Washington Monument at night. Students (and OCS staff) were also able to take advantage of what DC had to offer – from dinner at a restaurant specializing in grilled cheese to live tapings of our favorite podcasts. All in all, a great way to spend a weekend building connections.